Chinese studio BENTU DESIGN has repurposed ceramic waste into a furniture collection. Each piece is made from mixed concrete and fragments of bowls, cups, and Buddha statues that are visible throughout. The mixture is cast into a mold; once set, a subtle color is applied to highlight the ceramic shards in each bench, lampshade, or side table. 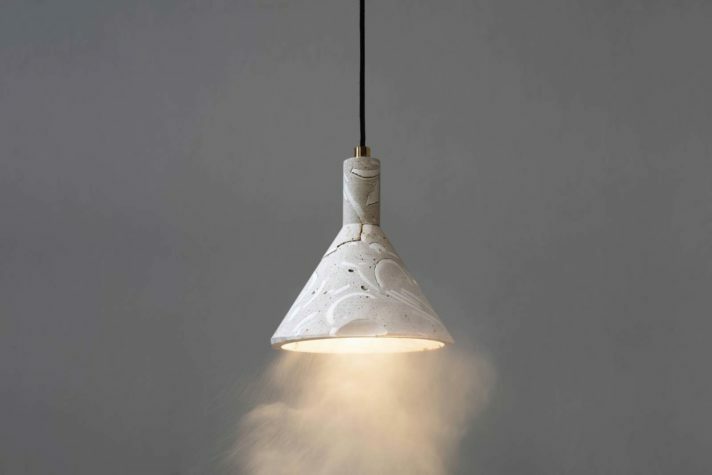 According to the studio, a recent rise in ceramic production has led to a rise in ceramic waste: “We always pay close attention to the ordinary and useless material like construction waste [and] pipes…it is not surprising that we now turn our hands to ceramic waste.” Bentu translates to “local creating,” and the studio is dedicated to repurposing wasted materials around the area of Chaozhou in eastern China. Bentu Design’s goal is to highlight the beauty found in waste by creating furniture from discarded materials. MAINE MARITIME ACADEMY is creating an annex at the former VERSO PAPER mill in Bucksport. The site’s owner, AMERICAN IRON AND METAL, and the academy have signed a purchase-and-sale agreement that is expected to be finalized soon. The center “will be an auxiliary enterprise, the revenue from which will support the college’s mission and programs,” says academy president William J. Brennan. The hope is that the center will annually train 2,400 seafarers and attract new residents—MMA students and professional mariners—to Hancock County. The CHILDREN’S MUSEUM AND THEATRE OF MAINE has received BANK OF AMERICA’s largest-ever grant in the state of Maine. The $250,000 grant will help the museum begin the next fundraising phase for its new facility on Thompson’s Point in Portland. Projected to open in 2020, the 30,000-square-foot facility will double the amount of space currently available to the museum; the new three- story building will have room for larger exhibitions, with one floor dedicated to STEM education as well as a dedicated arts space. Each exhibition is designed to be easily accessible for children and adults with special needs. Once complete, the new museum is expected to attract more than 200,000 visitors annually, doubling its current number of annual guests. The RUN OF THE RIVER WHITEWATER PARK, which is proposed for the KENNEBEC RIVER GORGE in downtown Skowhegan, is about to enter the permitting process. Since a project like this has never been permitted in Maine before, the process could take up to two years to complete. 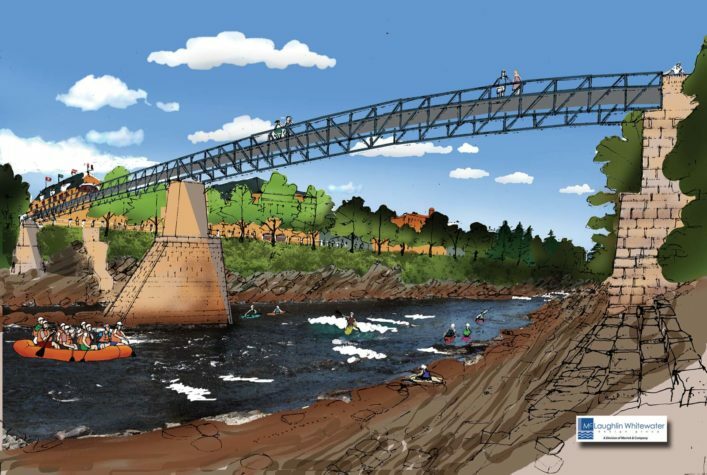 Once complete, the design process will move forward to include three whitewater river features, access trails, terraced seating on the river banks, and the removal of a railroad bridge that collapsed into the gorge following a flood in April 1987. The park is expected to generate $6 million in revenue in its first year alone and an upward of $19 million by its tenth year. A new events center and operations building at the NEW ENGLAND OUTDOOR CENTER on Millinocket Lake has been approved by the MAINE LAND USE PLANNING COMMISSION. The project is part of a $1 million expansion that includes plans to build two buildings, totaling 10,000 square feet, that will add jobs and grow year-round opportunities such as conferences and weddings. New England Outdoor Center, along with Twin Pines Camps, was founded in 1982 by Matthew Polstein. The center, which was originally part of a $15 million expansion plan that incorporated an upscale resort and luxury family units, borders Baxter State Park and overlooks two of Maine’s best-known landmarks: Mount Katahdin and Millinocket Lake. City-dwelling insects have a new respite in the form of artificial flowers. Created by Dutch designer MATILDE BOELHOUWER, the flowers are made from screen-printed polyester that transform rain into sugar water to serve as an emergency food source for urban pollinators. Five different flowers were created, each with a specific quality to attract a certain type of insect: bumblebees, other bees, hover flies, butterflies, and moths. The polyester flowers have a 3-D–printed container in their center. This container collects rainwater, which transfers to the stem and mixes with sugar. The sugar water is then automatically pumped back into the small container. 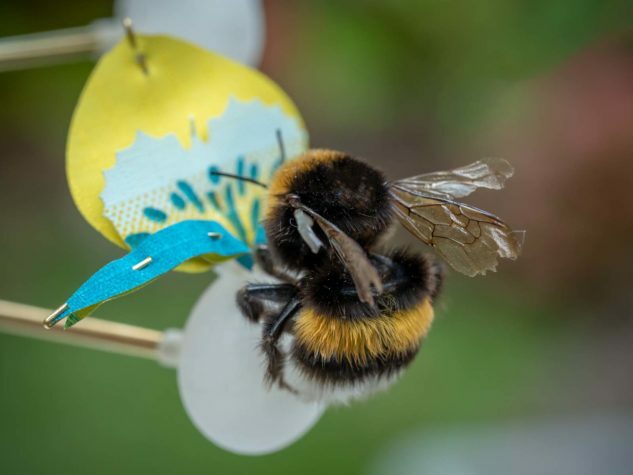 Boelhouwer was inspired to begin the project, FOOD FOR BUZZ, after researching insect populations and concluding that there has been a 75 percent decline of insects in both rural and city areas over the past 27 years.